Start with the image you want to transfer. 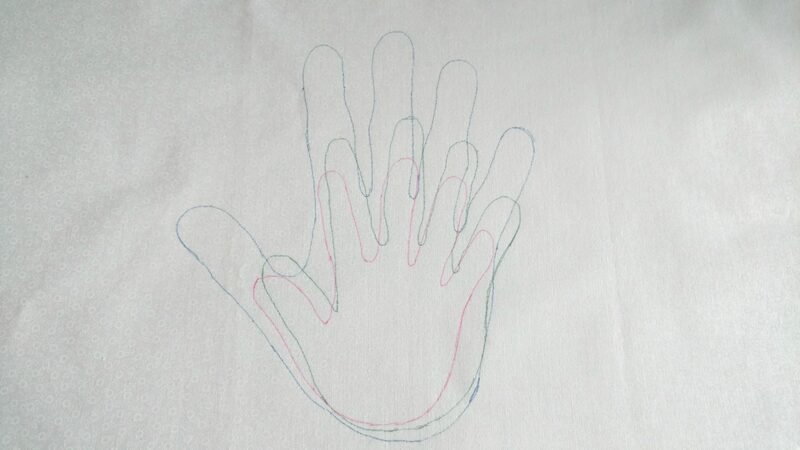 Trace the shape onto the paper side of the fusible web. 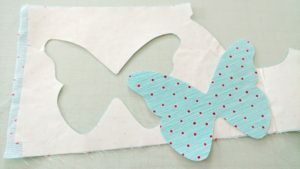 (TIP cut the fusible web smaller than your applique fabric TIP cut a large piece of parchment paper and fold in half like a card. 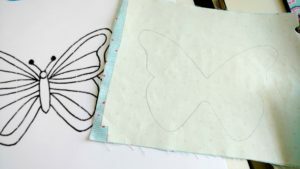 Place your fabric and fusible web within the parchment card to protect your iron and ironing surface for excess adhesive) Iron onto the back of the fabric you are using for the applique. Carefully cut on your drawn line. Peel away the paper backing on your applique and position on your background fabric. 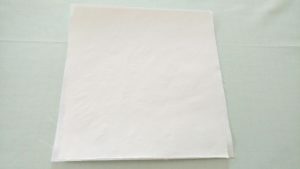 TIP to remove paper backing either score with a pin or gently fold back an edge to separate the paper from the adhesive. 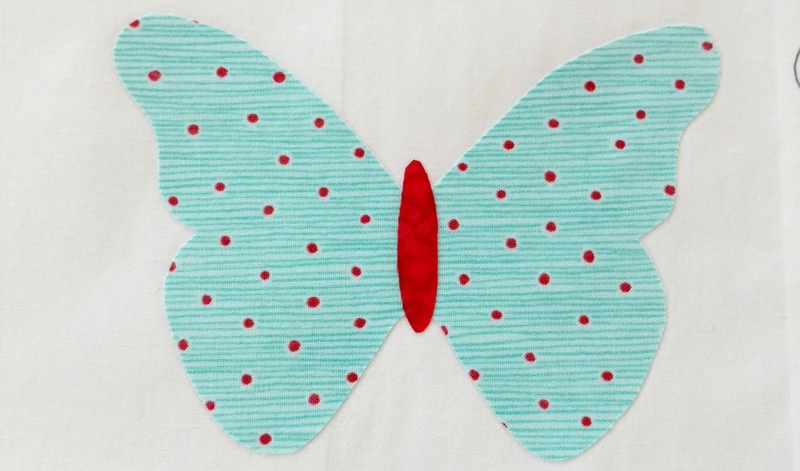 Place your background fabric with the applique in place within the parchment envelope. Iron to affix to the background fabric. If you are using the Heat-n-BondULTRA Hold , you are now finished. Freezer paper is often used in quilting. 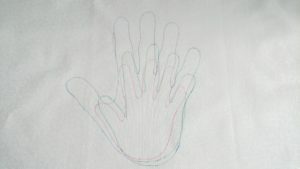 It is used to stabilize the fabric, making it easy to write on the fabric without dragging or distorting the fibers. 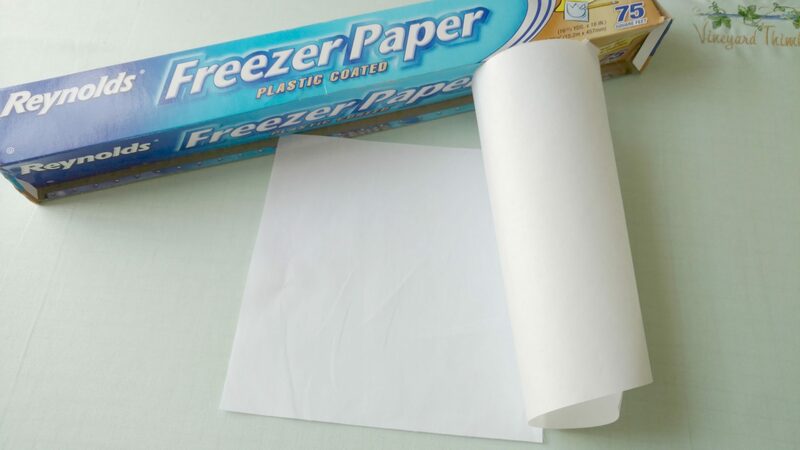 Cut a piece of freezer paper slightly smaller than your fabric. 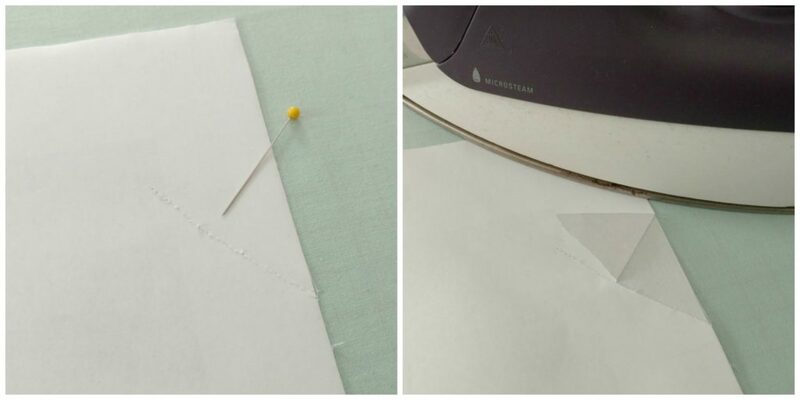 Iron fabric to remove all wrinkles. Place fabric onto waxy side of freezer paper and iron together. If you have any wrinkles just peel it back and iron again. Lightbox, backlit device (tablet/phone), bright window, glass table or plastic box with pop light ply place it under your prepared fabric and check to see if you can see it through the fabric and freezer paper. If you cannot, a light box comes in handy. No light box, no problem! 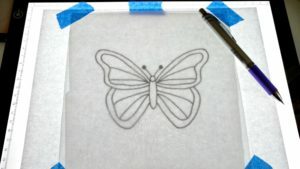 Here are some great ways to improvise a light box for ease in transferring your design. Use a bright window. 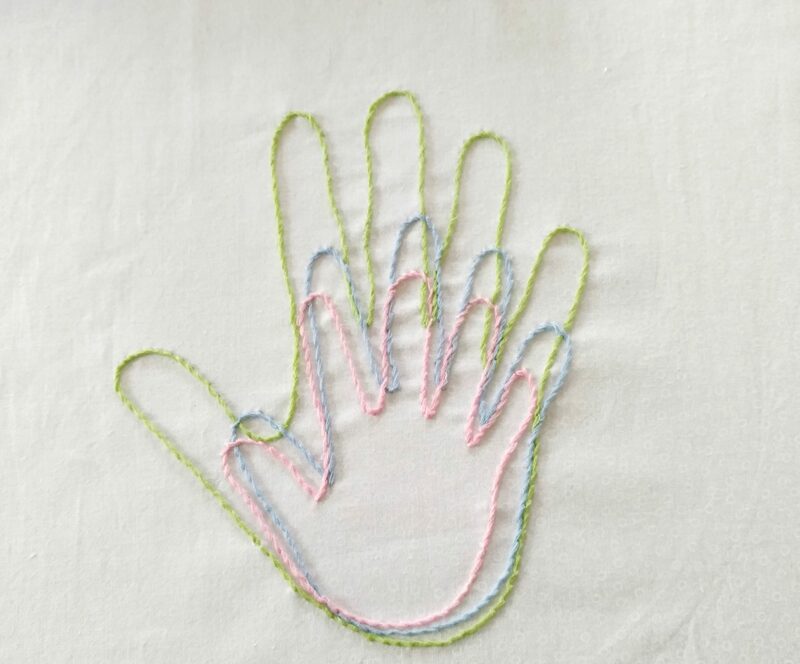 Tape your artwork and fabric onto a window and lightly trace using a pencil. Use a glass table with a lamp placed underneath the table. Use your tablet or phone as a light box. 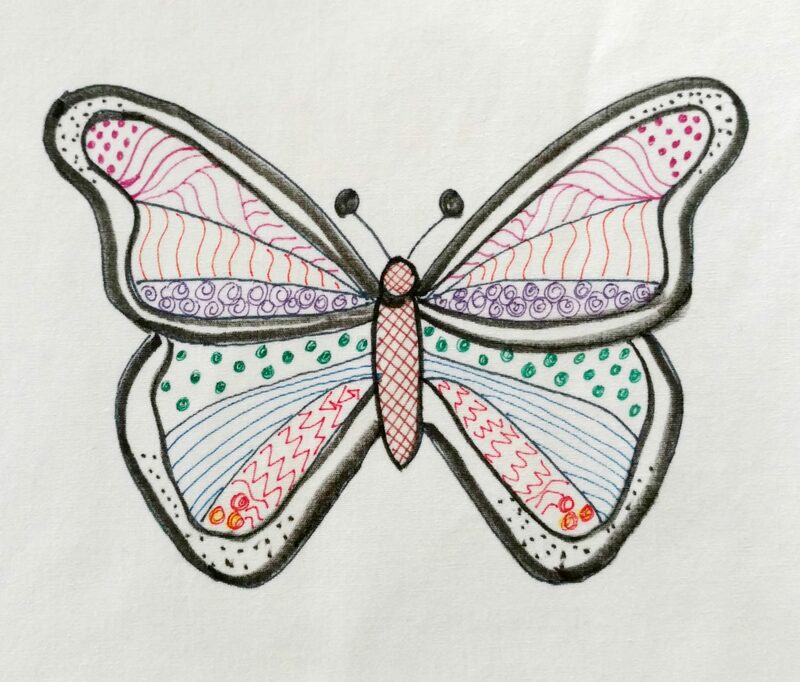 Color your image using crayons just as you would a coloring book. 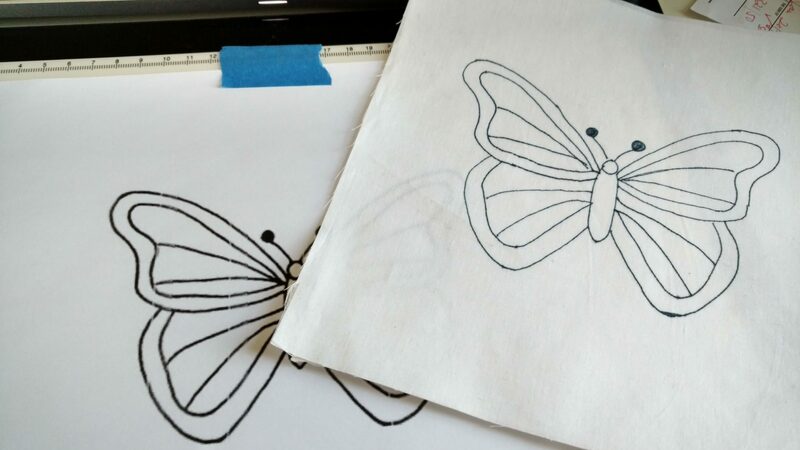 With this technique, I will lightly trace the image with a pencil and go over it with an archival pen. 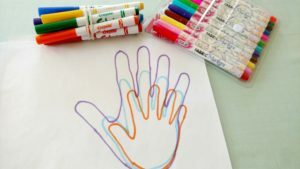 Next, I will use crayons to color it in. 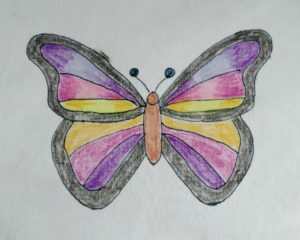 I have had the best result with Crayola crayons as the color is nicely saturated. 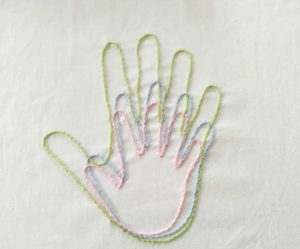 Once it is completed, cover your block with a press cloth (either a piece of paper toweling, plain copy paper or a scrap of fabric). 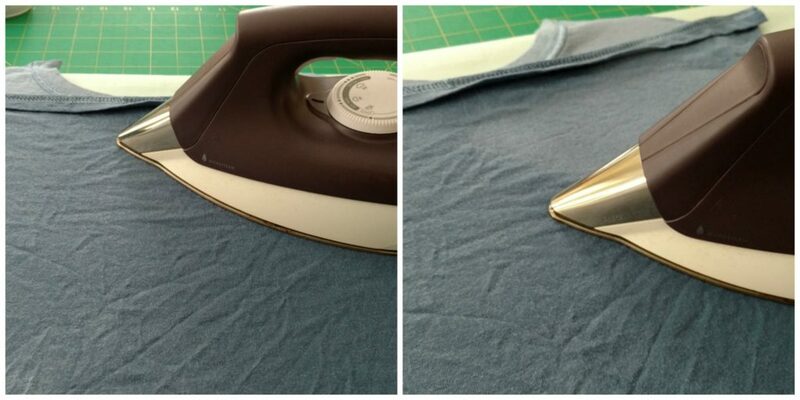 Iron your block with a hot dry iron. 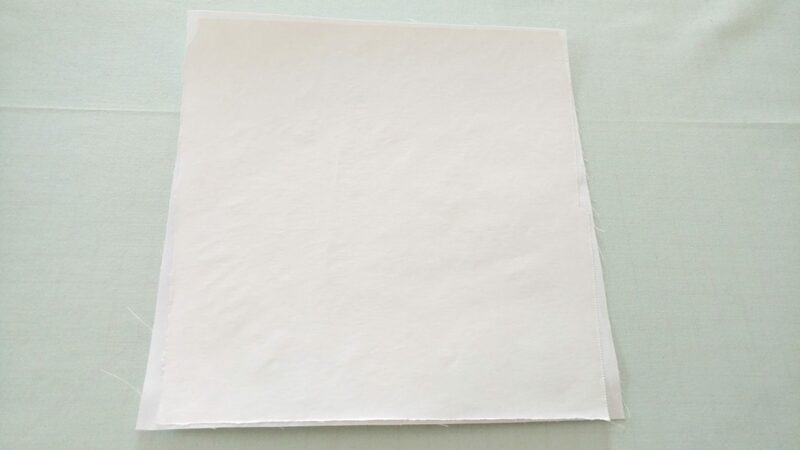 This will melt and lift the excess wax from the block and deposit it onto your press cloth. 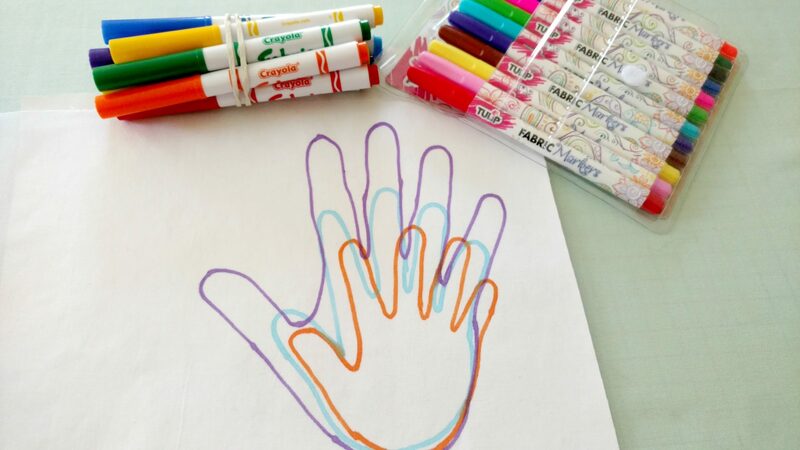 I traced the hands using a Pilot Frixion Pen Amazon affiliate link The markings from this pen with disappear with the heat of an iron. Then I embroidered with floss using a stem stitch. 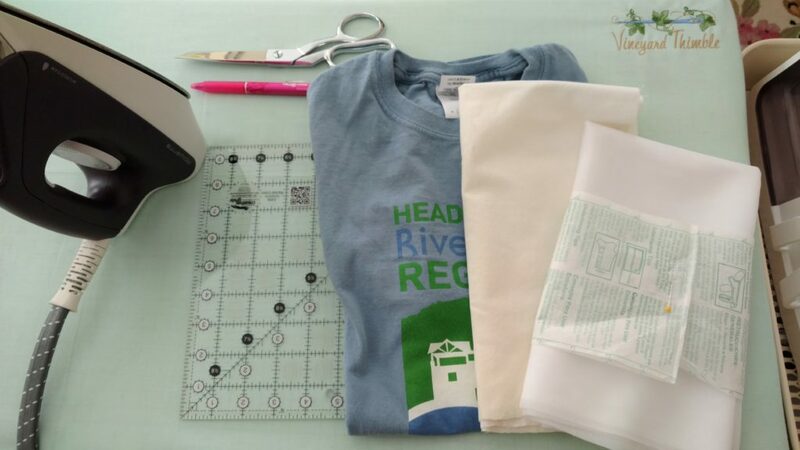 This is what you will need to make a quilt block using a t-shirt. 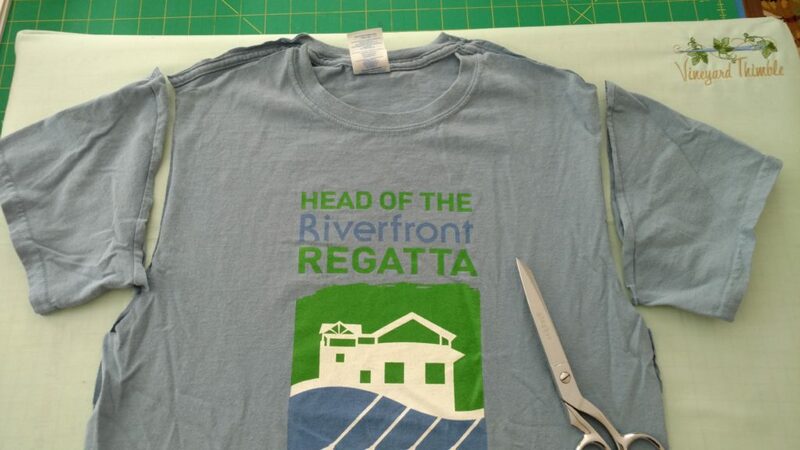 The first step in preparing your t-shirt will be to cut off the sleeves. Then cut across the shoulders and down the sides separating the front from the back. Discard the sleeves. If the back is not printed with a graphic, set it aside. 1) Turn the front of the t-shirt over and give it a press with an iron set to Wool/Silk w/steam. If the back of the t-shirt doesn’t have any graphics, it can be used as a press cloth. To dampen it, wet your hands and use the T to dry them. Repeat this step until the T is sufficiently dampened, similar to a wet dish towel. 2) Place your interfacing glue side down onto the back of the ironed T-shirt. TIP The glue side of the interfacing is rough with bumps. TIP T-shirts stretch more side to side than they do the top to bottom. Lay the interfacing with it’s the stretch going opposite to that of the T-shirt. To determine the stretch of each, simply tug the edges side to side and top to bottom to determine which direction has more stretch. This is a really important process because the WATquilt hangs for an entire year. The interfacing stabilizes the T-shirt fabric which prevents it from stretching and curling during the quilt construction and also helps to keep it from sagging once finished. It’s even more important if the block will be embellished in any way. BE SURE TO READ THE MANUFACTURES INSTRUCTIONS FOR THE INTERFACING YOU ARE USING. My instructions say to set my iron to the wool/silk setting with steam and to press each spot for 10 seconds. Lay the iron straight down and hold for the recommended time. Lift straight up and move the iron to the side with a slight overlap. DO NOT SLIDE IRON BACK AND FORTH, LIFT UP AND DOWN. 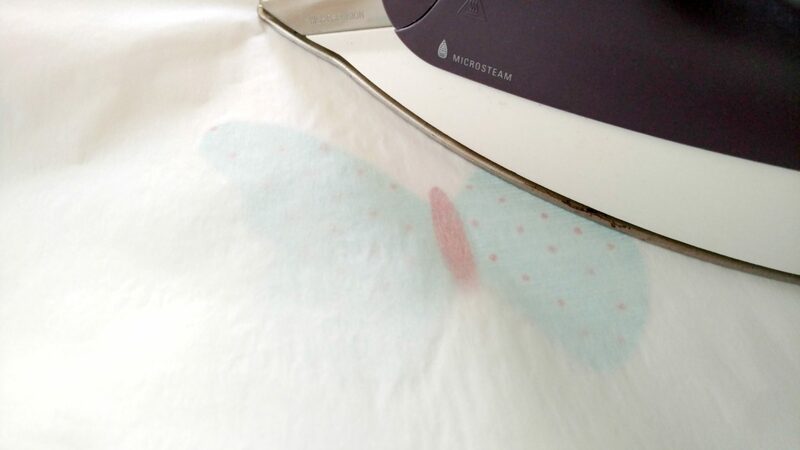 My press cloth was almost dry by the time I ironed the entire surface. Remove the pressing cloth and allow the T-shirt to cool. Then turn it over and mark the size of your block. Class of 2017, you will be cutting an 8.5″ x 8.5″ square. Carefully cut out your block using either scissors or a rotary cutter and mat. All done! Class of 2017, the quilt block you will be making needs measure 8.5”x8.5” square. This measurement includes a seam allowance of a quarter inch all the way around. I really like this particular brand because the fabric is smooth and the resulting images are clear and crisp. It can only be used on an ink jet printer, NOT laser or commercial printers such as those found in copy centers. The package provides very clear instructions. Starting with your image, make sure it is a good shot. If needed, make adjustments in your photo editing software and save. 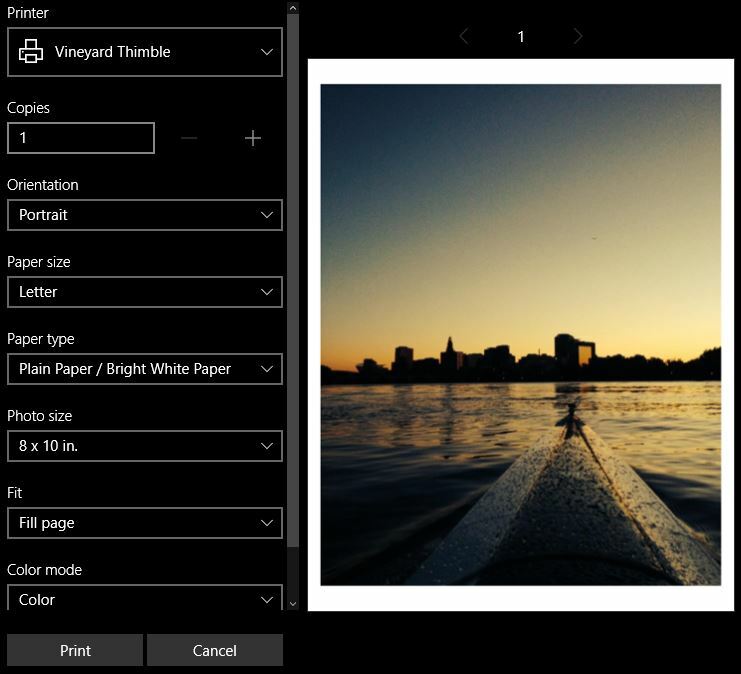 Keep in mind, quality photo equals quality print. I like to be sure that I have plenty of ink in my cartridges. 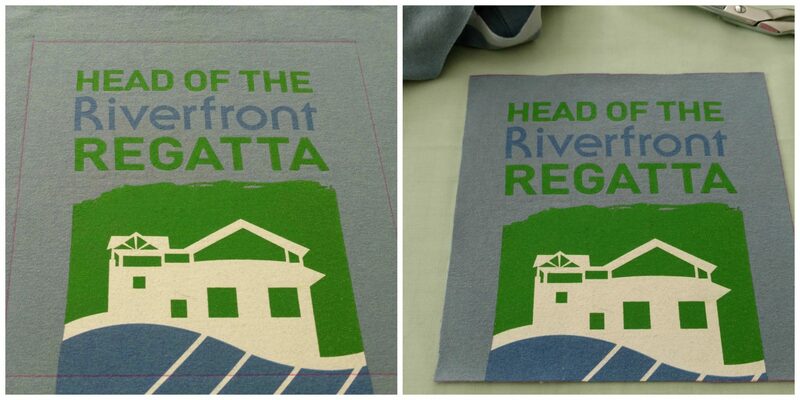 Be sure to load the sheet so that the image prints on the fabric side. I remove the regular paper from my feed tray and only put in one sheet of the fabric paper at a time. 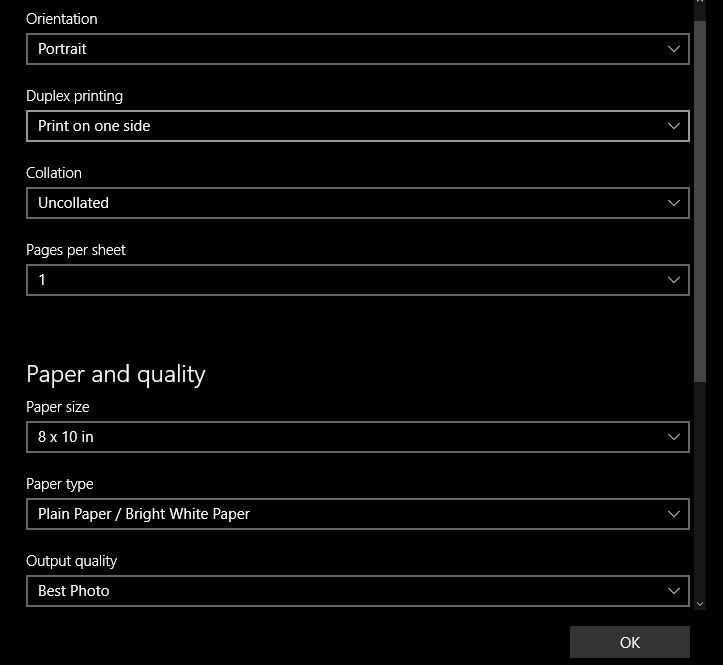 Before printing actual photo I run a fabric test sheet through my printer. I call it the “cleaner sheet”. I’ll either print a document that says TEST or I will photocopy a handwritten doc that says TEST. I like to do this process because I’ve found that it helps pick up any stray ink that may be on the print rollers. I will then save this test print for future printings. DO NOT TOUCH! allow the ink to dry for a few minutes. To remove the paper, I will score the paper on the back with a pin. Then iron the paper side to loosen the hold and peel back from the scored edge. I’ve found it does not want to come off without being heated. Trim to 8.5″ x 8.5″ and you are done. My name is Paola Dumeer and I am overseeing the construction of the 2017 class memory quilt. I am here to help and look forward to working with you. A memory quilt is a wonderful keepsake. It is constructed in the typical fashion of making a quilt. Various fabrics are arranged, sewn together and ironed flat to form the front known as the quilt top. It is set on top of a layer of batting then backed with another piece of fabric. The process of attaching all three layers together is called the quilting. When constructing a memory quilt, the process above is completed before any embellishment takes place. What has become challenging with our Watkinson quilt, is that the construction has to happen with all the embellishing already complete. This can make the sewing and need to iron very difficult. Please keep this in mind when working on your quilt block, and be sure to use items that are appropriate for textiles and sewing. 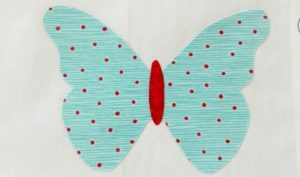 Items such as buttons, beads, trims or any other appliqued items are fine as long as they are kept closer to the center. They should be heat proof. 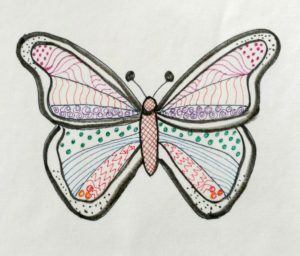 I will be posting short written tutorials that I hope you will find helpful while working on your quilt blocks. I will also detail the materials I often use, with links to help you find them. Please feel free to reach out to me if you’d like assistance on a particular design idea. Lastly, please note the required size quilt block this year will be 8.5″ x 8.5″. Please remember to keep your designs within a 1/4″ from all sides. Custom Embroidery Services in Glastonbury, Connecticut.